From the earliest European visitors to the Westward Expansion of the United States, white settlers often encountered the American Indians. Though many of these meetings were peaceful, the cultures more often clashed, resulting in hundreds of battles and skirmishes, between the Indians and pioneers encroaching upon their lands, as well as conflicts between the tribes and the U.S. Army. Though confrontations with the Indians virtually occurred since the first European explorers and settlers set foot on American soil, the “Indian War period” is primarily referred to as occurring between 1866 and 1890. These many conflicts are often overshadowed by other periods of U.S. history. 1540-1541 – Tiguex War – Fought in the winter of 1540-41 by the army of Francisco Vasquez de Coronado against the 12 pueblos of Tiwa Indians along both sides of the Rio Grande River in New Mexico. It was the first war between Europeans and Native Americans in the American West. March 22, 1622 – Jamestown Massacre – Powhatan Indians kill 347 English settlers throughout the Virginia colony during the first Powhatan War. 1622-1644 – Powhatan Wars – Following an initial period of peaceful relations in Virginia, a twelve-year conflict left many natives and colonists dead. 1636-1637 – Pequot War – Taking place in Connecticut and Rhode Island, the death of a colonist eventually led to the destruction of 600-700 natives. The remainder were sold into slavery in Bermuda. May 26, 1637 – Mystic Massacre – During the Pequot War, English colonists, with Mohegan and Narragansett allies, attack a large Pequot village on the Mystic River in what is now Connecticut, killing around 500 villagers. 1675-1676 – King Philip’s War – King Philip’s War erupts in New England between colonists and Native Americans as a result of tensions over colonist’s expansionist activities. The bloody war rages up and down the Connecticut River valley in Massachusetts and in the Plymouth and Rhode Island colonies, eventually resulting in 600 English colonials being killed and 3,000 Native Americans, including women and children on both sides. King Philip (the colonist’s nickname for Metacomet, chief of the Wampanoag) is hunted down and killed on August 12, 1676, in a swamp in Rhode Island, ending the war in southern New England. In New Hampshire and Maine, the Saco Indians continue to raid settlements for another year and a half. 1680-1692 – Pueblo Revolt – In Arizona and New Mexico, Pueblo Indians led by Popé, rebelled against the Spanish and lived independently for 12 years. The Spanish re-conquered in them in 1692. 1689–1697 – King William’s War – The first of the French and Indian Wars, King William’s War was fought between England, France, and their respective American Indian allies in the colonies of Canada (New France), Acadia, and New England. 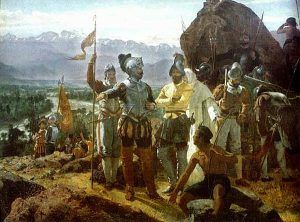 It was also known as the Second Indian War (the first having been King Philip’s War). February 8, 1690 – Schenectady Massacre – French and Algonquin Indians destroy Schenectady, New York, killing 60 settlers, including ten women and at least twelve children. February 29, 1704 – Deerfield Massacre – A force comprised of Abenaki, Kanienkehaka, Wyandot and Pocumtuck Indians, led by a small contingent of French-Canadian militia, sack the town of Deerfield, Massachusetts, killing 56 civilians and taking dozens more as captives. 1711 – Tuscarora War – Taking place in North Carolina, the Tuscarora War, led by Chief Hancock, was fought between the British, Dutch, and German settlers and the Tuscarora Native Americans. In an attempt to drive the colonists out of their territory, the tribe attacked several settlements, killing settlers and destroying farms. In 1713, James Moore and Yamasee warriors defeated the Indians. 1715-1718 – Yamasee War – In southern Carolina, an Indian confederation led by the Yamasee came close to exterminating a white settlement in their region. 1754-1763 – French and Indian War – A conflict between France and Britain for possession of North America. For various motivations, most Algonquian tribes allied with the French; the Iroquois with the British. August 1757 – Fort William Henry Massacre – Following the fall of Fort William Henry, between 70 and 180 British and colonial prisoners are killed by Indian allies of the French. 1760-1762 – Cherokee Uprising – A breakdown in relations between the British and the Cherokee leads to a general uprising in present-day Tennessee, Virginia and the Carolinas. 1763 – Pontiac’s Rebellion – In the Ohio River Valley, War Chief Pontiac and a large alliance drove out the British at every post except Detroit. After besieging the fort for five months, they withdrew to find food for the winter. September 14, 1763 – Devil’s Hole Massacre – Seneca double ambush of a British supply train and soldiers. December, 1763 – Conestoga Massacre – Pennsylvania settlers kill 20 peaceful Susquehannock in response to Pontiac’s Rebellion. July 26, 1764 – Enoch Brown School Massacre – Four Delaware Indians killed a schoolmaster, 10 pupils, and a pregnant woman. Amazingly two pupils who were scalped survived. 1774 – Lord Dunmore’s War – Shawnee and Mingo Indians raided a wave of traders and settlers in the southern Ohio River Valley. Governor Dunmore of Virginia sent in 3,000 soldiers and defeated 1,000 natives. 1776-1794 – Chickamauga Wars – A series of conflicts that were a continuation of the Cherokee struggle against white encroachment. Led by Dragging Canoe, who was called the Chickamauga by colonials, the Cherokee fought white settlers in Tennessee, Kentucky, Virginia, North Carolina, South Carolina, and Georgia. 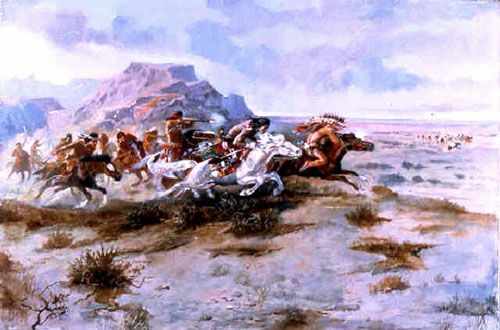 July 3, 1778 – Wyoming Valley Massacre – Following a battle with rebel defenders of Forty Fort, Iroquois allies of the Loyalist forces hunt and kill those who flee, then torture to death those who surrendered. August 31, 1778 – Stockbridge Massacre – A battle of the American Revolution War that rebel propaganda portrayed as a massacre. November 11, 1778 – Cherry Valley Massacre – An attack by British and Seneca Indian forces on a fort and village in eastern New York during the American Revolution. The town was destroyed and 16 defenders were killed. 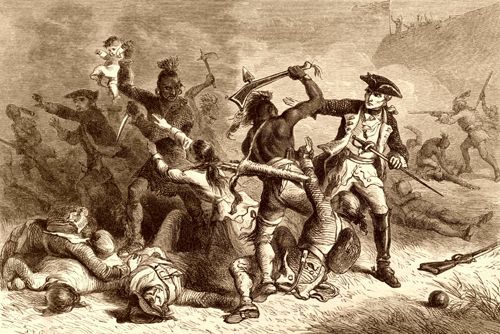 March 8, 1782 – Gnadenhutten Massacre – Nearly 100 non-combatant Christian Delaware (Lenape) Indians, mostly women, and children, were killed with hammer blows to the head by Pennsylvania militiamen. 1785-1795 – Old Northwest War – Fighting occurred in Ohio and Indiana. Following two humiliating defeats at the hands of native warriors, the Americans won a decisive victory under “Mad Anthony” Wayne at the Battle of Fallen Timbers. 1794 – Nickajack Expedition – Cherokee Chief, Dragging Canoe, and his followers, who opposed the peace, separated from the tribe and relocated to East Tennessee, where they were joined by groups of Shawnee and Creek. Engaged in numerous raids on the white settlers for several years, they used Nickajack Cave as their stronghold. In 1894, the military attacked, leaving some 70 Indians dead. I think it would be helpful if you would identify the location of the battles. Hello, I want to know if these conflicts between the Natives and the Europeans lasted until the last 5/6 decades, around ’50s or’60s. Was there any battle during these times. Please help with authentic historical account. No, as mentioned in this article, the last battle was in October 1898. Actually, there was a battle in 1970. The last military action involving the U.S. Government was 1898.